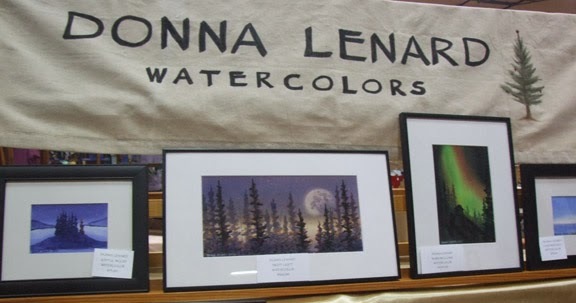 A year after her return to the western U.P., watercolorist Donna Lenard is culling her best for holiday art shows, including the 37th annual Poor Artists Sale from 11 a.m. to 4 p.m. Saturday, Dec. 7, in Calumet. 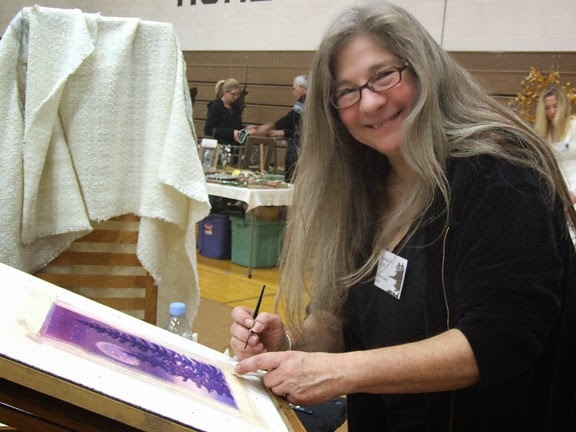 She’s also mulling a retrospective exhibit that’s snapped into sudden focus with the clarity and intensity of a Keweenaw winter. Lenard, fresh off a decade spent living in a small wooden cabin tucked into the wilds of the Goldstream Valley north of Fairbanks, is one of more than 60 talented artists and artisans showcasing their wares at a venerable and stellar event prized by those who delight in one-of-a-kind finds. "I liked the feeling of being in a little box in the wilderness," Lenard says of her Alaskan sojourn. "I am not a curtain person. I had lots of moose in the back yard. They were my only garden tenders. They liked to nibble on the willows." There were advantages to life without indoor plumbing. The northern lights that first dazzled her during an outhouse trek on a frigid February night resulted in her popular "Warm Welcome" series. Northern lights and boreal landscapes are among Donna Lenard's favorite subjects. 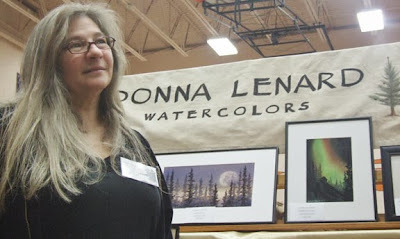 Describing her work as "loose and dreamy," Lenard says, "I like using washes -- dreamy and tranquil is what I hope to achieve, so people’s imaginations can work with the paintings. Being self-taught allows me to be more open. When people say, 'I’ve never seen anything like that,' or 'this reminds me of a place I used to go,' that’s the stuff that keeps you going." There is a definite theme of trees running through the majority of Lenard’s work. "Most everything I paint will have trees," she says. Lenard likes to work on a painting in progress during her shows and has even collaborated with musicians during live performances. And so it is with two of her current pieces, "Joyful Wood" and "Lakeside Yule," featuring the iconic evergreens that inject color and life into otherwise bleak winter landscapes. "Boreal Hideaway," a serene and symmetrical series of birch trunks, features a tender green-and-yellow spring palette. The avid birder is no stranger to the western Upper Peninsula. She moved here in her 30s and continues to explore via snowshoe and canoe, reveling in all seasons, although fall is her favorite, for "the color and the smells in the air." Her preferred time of day in any season is "right when the sun is starting to set." An Illinois native who grew up in the Chicago suburbs, Lenard was introduced to the U.P. through a romantic relationship. "I was dating a guy who vacationed in Rockland. I instantly fell in love with the Upper Peninsula," she says. "I moved to the U.P. with new eyes." Moving to Alaska several years later was a long-time dream come true. "I had been wanting to go there since I was 16," Lenard says. Mission accomplished; and after 10 years it was time for another transition. Lenard loaded up her belongings and with the help of friend Deborah Hilscher of Portage Entry drove a U-Haul truck from Fairbanks to Keweenaw, camping and sight-seeing along the way. The only disappointment was the guard’s refusal to stamp their passports at the Canadian-U.S. border. They’d been looking forward to that. As is her habit Lenard will be working at her easel during the Poor Artists Sale, drawing energy from Keweenaw’s colorful tribe of creators and patrons. The easygoing cat lover doesn’t view these kinds of events as a place where many paintings will necessarily be sold. The atmosphere is hectic; crowds block contemplative views. But seasonal shows are a great introduction that can lead to future sales and commissioned work. Smaller, inexpensive items such as hand-painted gift tags, magnets featuring miniatures of her original works and stationery embossed with those entrancing northern lights are other easy entry points to familiarization. Perhaps the most wondrous aspect of Lenard’s current path is an everything-old-is-new-again revelation. "I keep all my rejects," she explains. "I didn’t realize I’d brought 30 black bags back with me from Alaska." Among those efforts were several pieces that show exciting promise for further development. They also showed Lenard a personal and professional progression that will lend itself well to a one-woman exhibit, a project now on her drawing board. Lenard is also happily re-establishing contact in her old stomping grounds farther to the west, in Silver City, at Jackie McMullen’s Great Lakes Trading Company. A new lakescape series in preliminary development features the many moods and color spectrums of Mother Superior. An optician by trade, Lenard benefits from a portable second profession. Her discerning eye also prompts her to carefully examine each piece in progress from every possible angle. The optometrist remains true to her artistic vision. "I always take my work and look at it in a mirror, look at it upside down. I want it to be present. In my portraits, I want the gaze to follow." 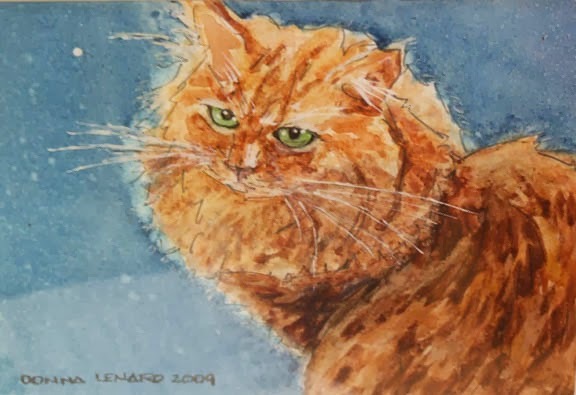 Lenard, who previously worked in detailed pencil, doesn’t naturally lean toward painting people, animals or flowers. "I’ve done a lot of commissions. They are sometimes difficult but it pushes me in a good way in new directions -- things I would never do on my own," she says. That’s how Lenard’s "Pet Pride Portraits" was established. "My friend Larry’s dog passed away. I knew the dog. It was a friendly, happy dog," says Lenard, who works from photos to create cherished keepsakes. Honey Girl, one of Donna's kitties, serves as an illustration of her prowess with commissioned pet portraits. Lenard says she paints every day: "I will go at it in the morning for three to four hours until I’m hungry. 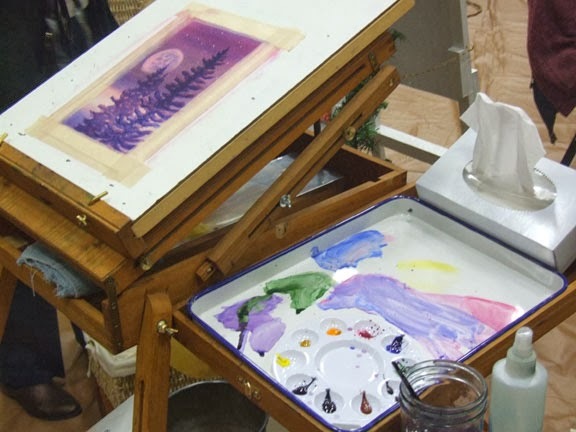 I keep my easel set up all the time. That blank page just calls me over." Having just finished the first draft of my novel manuscript, I can’t resist a self-centered question: "Donna, how do you know when you’re done?" She laughs, tossing her lush curtain of salt-and-pepper hair. "Good question," she says. "I know when I’ve put too much in it. You want everything to fit together; there has to be a flow to it. Sometimes I just like to do the washes and then let it sit and simmer. I have been known to blow dry a work that I want to get back to in a hurry, but most of the time I like to give myself the time to look at it and see what’s missing." Feel free to ask Lenard questions if you stop by her booth. She enjoys teaching as well as learning tricks of the trade, knowing firsthand the value of shared knowledge. "I’m open to doing instructing here, but I’d need to find a space," Lenard notes. "I’m not rigid. I don’t want to tell you how to paint but how the color and water works." Lenard doesn’t paint on canvas. She’s constantly experimenting with different paper weights and textures, as well as paints (currently using a honey-based brand). She displays the Yupo brand plastic watercolor surface during exhibits, just in case any fledglings are wondering how to work with this relatively new material. "You can spray it with water and wash it off to re-use when you’re playing with different techniques," she explains. For example, "salt makes nice snowflakes," says the artist, chuckling over the memory of announcing this new-to-her method in front of a friend and his daughter. "We learned that in fourth grade," the little one announced. "What was a fresh technique to me was nothing new to this child," Lenard says, smiling. "It’s about seeing new things and trying to create new images. I’m excited to see what’s going to happen in the future -- how the work is going to progress." 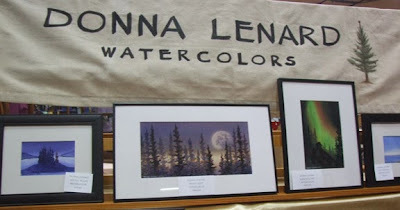 For a virtual gallery tour of Lenard’s work, visit her Facebook page. * Guest author Cyndi Perkins is a free-lance writer, former editor of The Daily Mining Gazette and a seasonal Keweenaw resident.